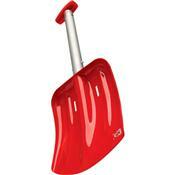 G3 made the Spadetech Shovel with a strong, lightweight, compact design. This backcountry travelers a durable shovel that is easy to pack and easy to pull out. The rounded leading edge and low-angle blade penetrate consolidated snow, and the T-Grip handle provides a solid hold when you're digging snow pits. A TIG-welded connector tube increases this avalanche shovel's durability, and the Spadetech's slotted blade allows for rescue-sled construction.